The Abbey Apartment in first floor of a historic building overlooking a picturesque square and the old Abbazia di San Francesco – in the heart of Alghero’s historic centre. 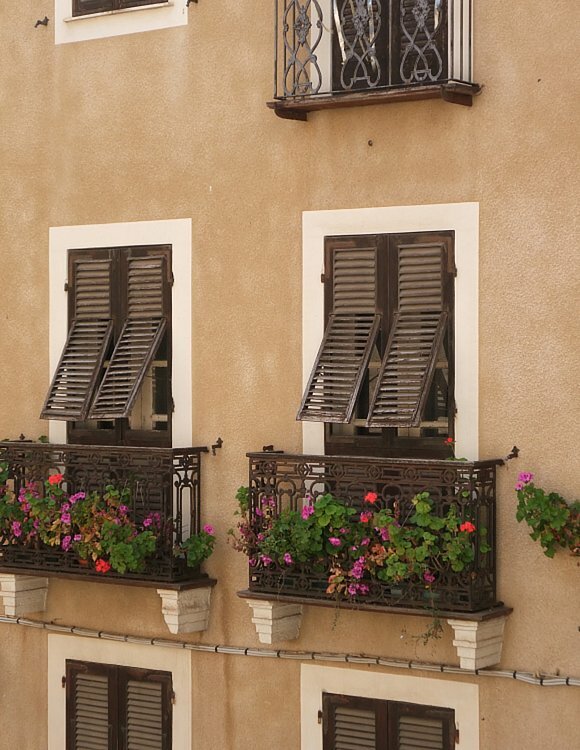 A 2 bedroom or a one bedroom apartment finely decorated and refurbished to charming town houses perfect for exploring this ancient Sardinian town and to stroll to the lido and the beach. The 2 bedroom apartment (sleeps 6) consists of a very spacious master bedroom with balcony and corner sofa – and king size bed- tall fitted cabinets – in this room there is also a small table to work and a computer the apartment has 2 modern bathrooms with shower- and a twin bedroom with tall fitted cherry wood cabinets and pretty balcony. new and comfortable sofa (this can also be set-up as a queen size sofa bed). The kitchen is perfectly fully equipped a pleasure to prepare nice food. There is an entry hall which leads onto the open plan living room with kitchen and dining area, this room is very welcoming with windows opening onto the old narrow lanes filled with boutiques and small cafeterias – and the charming abbey of San Francesco – To the right a row of historic buildings boasting from their balconies colourful hanging baskets with flowers and ivy. The apartment is fitted with washing machine, oven, Wi-Fi, Iron and Ironing table (there is also a large cabinet for storage), TV. The one bedroom apartment (sleeps 2+2) Very similar to the 2 bedroom Abbey Apartment this is perfect for a couple or a small family as there is a comfortable new sofa bed in the lounge. Artistic and welcoming, the apartment is decorated with much charm and attention to details. The apartment creates the perfect environment to enjoy this wonderful historic town, which has kept its unchanged charm through the passing years. A small hall leads to a comfortable living room with kitchen corner and dining table/area – the kitchen is very modern and fitted to the smallest details. Double bedroom with first class King size bed, tall fitted cabinets – an antique lamp – pretty bed tables.